There are various versions of Titian’s lost portrait of the powerful daughter of Emperor Suleiman the Magnificent (1494 – 1566), but our example is the only one to show the princess before a luxurious dark green and gold fringed curtain, with a matching green bashlyk, or headdress. Mihrimah wears a formal entari, a long outer robe buttoned from waist to throat, in an intricately patterned russet silk, but it is her headdress that is most striking. Hats at that time were the most prominent accessories of social status, and during the reign of Suleiman, these bashlyks called ‘perişani’ were decorated with gold and precious stones in the royal court, and billowing silken veils. Headgear was the principal visual signifier of the ‘Oriental’ to westerners too, so this portrait would have been instantly recognizable as an idealized Ottoman image. Arguably where the artist could only guess at the original features of the sitter, her enormous and striking headdress, distinctly shaped and gleaming with gold and precious gems, has become the focal point. It is perhaps no surprise that during the Renaissance turbans got bigger, as the ‘eastern threat’ gripped the European imagination. Private collection, France, until 2017. Titian and his studio produced a profile portrait of Mihramah’s father, Suleiman the Magnigicent, based on studies by European envoys to the Ottoman court. Presumably this was also the case for his portraits of Suleiman’s favourite wife, Hürrem Sultan (d. 1558), (mother of Mihrimah), and of course the portrait of Mihrimah herself. Their authorship by the most eminent workshop of the day says much about the power of ‘El Gran Turco’ as the Sultan was widely known in Europe at the time. These portraits are important representations of the inter-cultural and political exchange between Venice and the Ottoman Empire, and that city’s role as a portal to the Orient. They are all variously attributed to Titian's workshop and followers. The artist’s use of assistants is well documented, and the existence of several versions of each type certainly points to the involvement of other hands in their creation. It is believed that the original portrait of Mihrimah by Titian was in the collection of the sixteenth century Italian humanist scholar, Bishop Paolo Giovio (1483 – 1552). His collection included portraits of men of letters, dead and living; artists and wits; popes, kings, and generals; he composed written lives or eulogia to accompany the portraits and built a Musaeum in Como to house them. His collection became part of the Renaissance cult of glory, and the prototype for many later portrait collections of famous individuals. In 1568, Vasari mentions having seen Titian’s portraits of Hürrem and Mihrimah Sultans in this collection (after Giovio’s death). Although a flood in 1569 destroyed almost all of the collection, an inventory from that year makes mention of a ‘Turkish Hall’ (Sala de’ Turchi). It is also known that Cristofano dell’ Altissimo copied the paintings from Giovio’s collection for Cosimo I de’ Medici, among them the portrait of Mihrimah now in the Uffizzi, itself recorded in an inventory as early as 1557 in Florence. Mihrimah Sultan was the most powerful imperial princess in Ottoman history and one of the prominent figures during the Sultanate of Women. Her name, meaning ‘Sun and Moon’, was apt, given her significant power in the court. Mihrimah was not like other imperial Ottoman princesses of the time; she was active in political affairs even in foreign courts and had access to considerable economic resources. She also became chief of the Ottoman Imperial Harem during the reign of her brother, Selim II. Her position running the affairs of the harem in the same manner as the sultan's mother put Mihrimah at the top of the harem hierarchy. Mihrimah was born in Istanbul in 1522 during the reign of her father, Suleiman the Magnificent. Her mother was Hürrem Sultan, an Orthodox priest's daughter, who was the current Sultan's concubine at the time. In 1533 or 1534, her mother, Hürrem, was freed and became Suleiman's legal wife. On 26 November 1539 in Istanbul at the age of seventeen, Mihrimah was married to Rüstem, a devshirme from Croatia who rose to become Governor of Diyarbakır and later, Suleiman's Grand Vizier. Though the union was unhappy, Mihrimah flourished as a patroness of the arts and traveled throughout the Ottoman Empire with her father as he surveyed the lands and conquered new ones. Mihrimah’s rivalry with her half-brother Şehzade Mustafa, the son of Mahodevran sultan, is well documented. She and her husband became the dominant power in the inner court, and a great obstacle for Mustafa’s accession to the throne.The rivalry ended with Mustafa’s execution by his own father’s command in 1553. Had Mustafa ascended to the throne, all Mihrimah’s full-brothers (Selim, Bayezid, and Cihangir) would have likely been executed, according to the fratricide custom of the Ottoman dynasty, which required all brothers of the new sultan be executed to avoid feuds among imperial siblings. 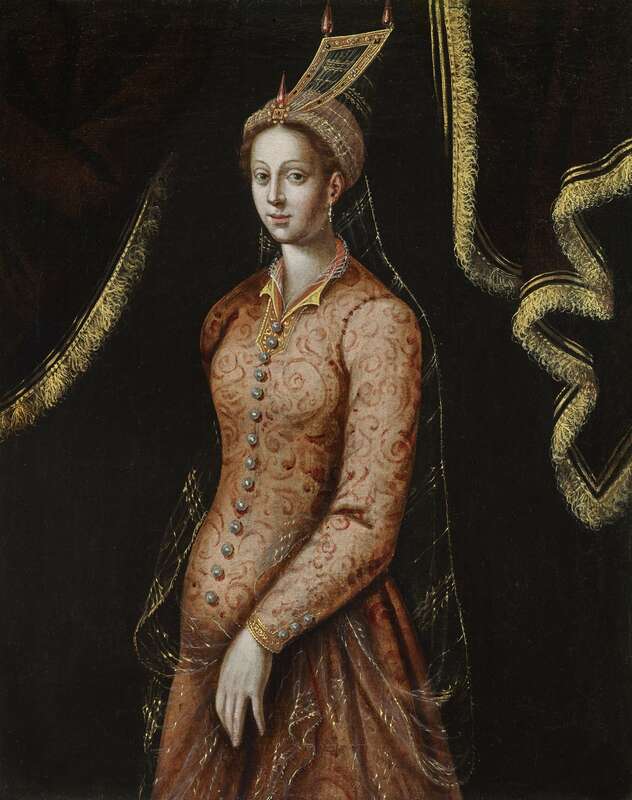 After the death of her mother Hürrem in 1588, Mihrimah took her mother’s place as her father’s main advisor, urging him to undertake the conquest of Malta and sending him news when he was absent from capital. Beside her great political intelligence, Mihrimah also had access to considerable economic resources and often funded major architectural projects. Her most famous being the two Istanbul-area mosque complexes that bear her name, both designed by her father's chief architect, Mimar Sinan: Mihrimah Sultan Mosque, in Üsküdar and built between 1546 and 1548, and Mihrimah Sultan Mosque at the Edirne Gate, by the western wall of the old city of Istanbul, built between 1562 - 1565. She died in Istanbul on 25 January 1578 during the reign of her nephew Murad III, outliving all of her siblings. Mihrimah was buried next to her father at Süleymaniye Mosque. There are at least Titian 'portraits' of Suleyman, as recorded in contemporary documents (see J.M. Rogers and R.M. Ward, Suleyman the Magnificent, exhib. cat. British Museum, London, 1998, p. 46 note 4 and H.E. Wethey, loc. cit.). The first was that executed for Federico Gonzaga, Duke of Mantua, in 1538. The second portrait was mentioned in a letter dated 7 March 1569, from Bishop Ippolito Capiluti of Fano, in Venice to Cardinal Ercole Gonzaga, where he wrote that he was sending a small picture (quadretto), of a portrait of the Turk by Titian (Gualandi, 1856, III, p. 20-22). The third work was recorded by Vasari. He reported having seen a portrait at the della Rovere Court in 1539 (Vasari (1568)- Milanese, VII, p. 444) and a century later Ridolfi listed the work amongst the portraits of famous men by Titian, but without mentioning the owner (Ridolfi (1648)- Hadeln, I, p. 192). The Urbino inventory of 1631 cites a portrait of Suleyman II. The fourth portrait could be that included by Titian in his Ecce Homo (Kunsthistorisches Museum, Vienna).